Today I am trying something new with my blog. 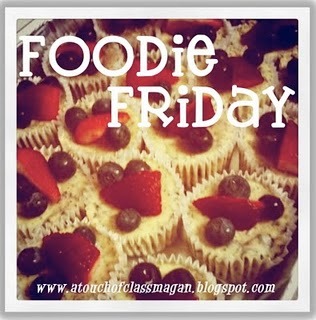 I am linking up with my friend Megan's blog for Foodie Friday! 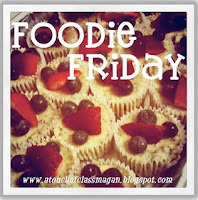 I love cooking and baking so today I am sharing with you another one of my grandmothers recipes. Today we are cooking up some Potato Salad. This Potato Salad is cooked at all BBQ's in my family. The funny thing is that every one in my family loves this stuff except for my grandmother and I who are always the ones who make it. I am just a picky eater and am weird about certain textures, but if you love potato salad I promise I have never found anyone who didn't love this recipe. This is one of my husbands favorites but his family made their potato salad a little different than my family, so I thought why not combine the two family recipes. So here it is and I hope you enjoy it as much as our families have! First bring a large pot of water to a boil. Place the entire potato into the pot and boil until soft. When soft remove the potato from the pot and set aside to cool. Once cool remove the skin of the potato and cut into chunks and place it into a large bowl. Then cut up your green onion and celery ribs and place them into the same bowl. In a smaller bowl put the mayo and add a little mustard to make the mixture a pale yellow color. Then mix the mayo mixture into the larger bowl of potato's, and add salt and pepper to taste. Then garnish with your crumbled up bacon and a sprinkle of paprika. Hope you bring this dish as a side to your next party or enjoy it with your family at you own cook out! Here is one of my favorite dessert recipes of all times, Oatmeal Chocolate Chip Cookies! I got this recipe from my grandmother about three years ago, and I have probably made them at least 50 times! My grandmother got this recipe while on a trip. They went to a friends home and arrived with the wonderful aroma of these delicious cookies. The smell was so enticing that they had to try them. My grandmother loved them and received this recipe over 50 years ago and we are still cooking them up for so many great occasions today! Hope you enjoy! First cream together shortening and sugars. Then add all the wet ingredients and mix well. Then add flour a half a cup at a time until mixed. Then combine oatmeal and chocolate chunks. Bake at 375 for 8 minutes! Hope your family loves this new twist on Chocolate Chip Cookies!